The holidays are right around the corner! While it won’t start feeling like winter here until mid-late December, I know other parts of the country are already getting the start of their wintery weather. Which means for some of you, snowman making time is almost here! 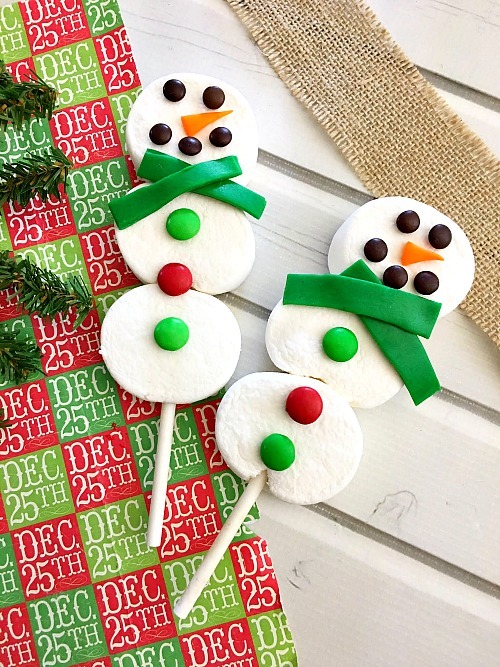 If you don’t usually get any snow where you live, you can still have some snowman fun with these Snowman Marshmallow Pops! 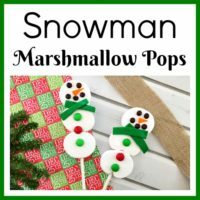 These snowman marshmallow pops are so easy to put together, even the kids can do it, probably all by themselves! Which makes this a fun Thanksgiving break or winter break recipe activity! 1. Carefully stick 3 white marshmallows onto a lollipop stick. 2. 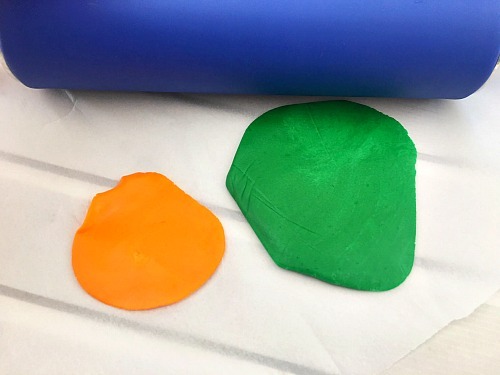 Roll out your orange and green fondant between two pieces of parchment paper. Cut out small triangle carrot noses from your orange fondant. Cut 1/4 x 2″ green pieces out for the scarves. 3. 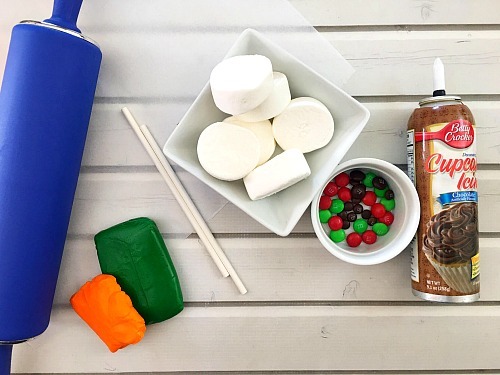 Use your icing to dot the M side of the miniature brown M&M’s and stick two onto the top marshmallow for eyes and 3 slightly below the eyes for the mouth. 4. Place a dot of icing onto an orange triangle and stick it below the eyes for the carrot nose. 5. Place a few dots onto the back of two green scarf rectangles, criss cross two pieces and stick them right under the snowman’s head for the scarf. 6. 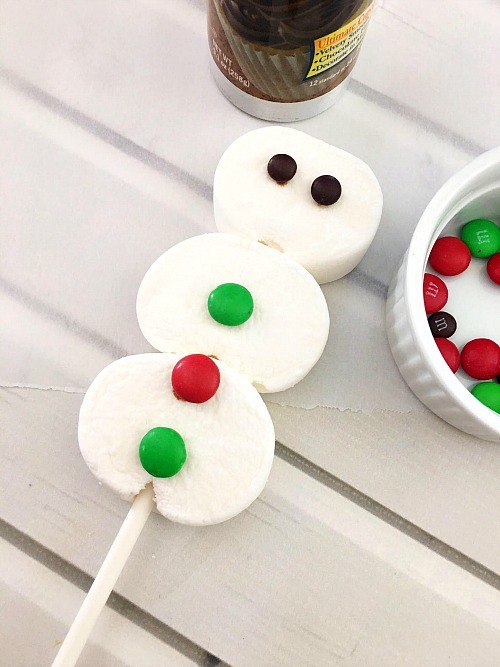 Now place a dot of icing onto the M side of 3 red or green M&M’s and stick them vertically onto the two lower marshmallow circles for the buttons. 7. Let set for 5 minutes. Then enjoy! 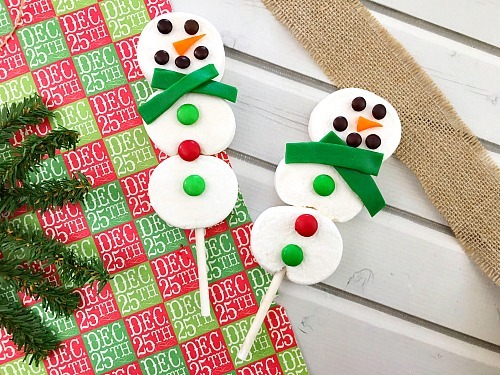 What fun treats do you like to make around the holidays? 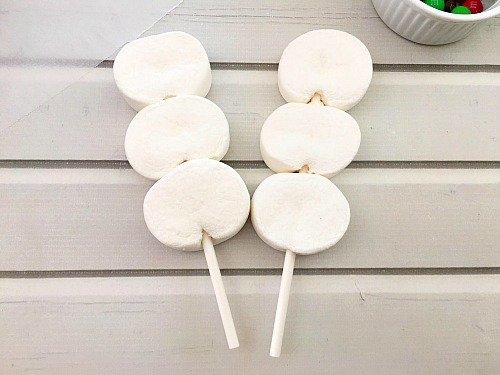 Carefully stick 3 white marshmallows onto a lollipop stick. 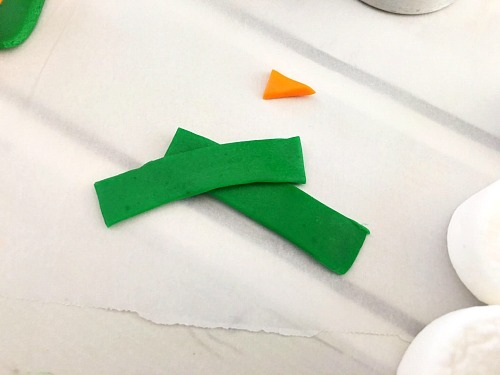 Roll out your orange and green fondant between two pieces of parchment paper. Cut out small triangle carrot noses from your orange fondant. Cut 1/4 x 2″ green pieces out for the scarves. Use your icing to dot the M side of the miniature brown M&M’s and stick two onto the top marshmallow for eyes and 3 slightly below the eyes for the mouth. Place a dot of icing onto an orange triangle and stick it below the eyes for the carrot nose. Place a few dots onto the back of two green scarf rectangles, criss cross two pieces and stick them right under the snowman’s head for the scarf. Now place a dot of icing onto the M side of 3 red or green M&M’s and stick them vertically onto the two lower marshmallow circles for the buttons. Let set for 5 minutes. Then enjoy! How sweet are these pops! I love it! Thank you for sharing on Merry Monday! Hope to see ya next week! Pinned!